Perfect for fans of Raina Telgemeier and Gene Luen Yang, New Kid is a timely, honest graphic novel about starting over at a new school where diversity is low and the struggle to fit in is real, from award-winning author-illustrator Jerry Craft. Seventh grader Jordan Banks loves n... read full description below. 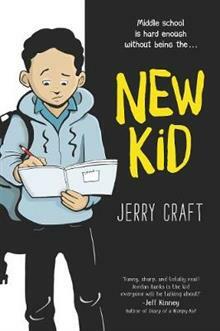 Perfect for fans of Raina Telgemeier and Gene Luen Yang, New Kid is a timely, honest graphic novel about starting over at a new school where diversity is low and the struggle to fit in is real, from award-winning author-illustrator Jerry Craft. Seventh grader Jordan Banks loves nothing more than drawing cartoons about his life. But instead of sending him to the art school of his dreams, his parents enroll him in a prestigious private school known for its academics, where Jordan is one of the few kids of color in his entire grade. As he makes the daily trip from his Washington Heights apartment to the upscale Riverdale Academy Day School, Jordan soon finds himself torn between two worlds-and not really fitting into either one. Can Jordan learn to navigate his new school culture while keeping his neighborhood friends and staying true to himself? Jerry Craft is an author and illustrator who has worked on numerous picture books, graphic novels, and middle grade novels, including The Zero Degree Zombie Zone by Patrik Henry Bass. Jerry is the creator of Mama's Boyz, an award-winning syndicated comic strip. He has won five African American Literary Awards, and he is a cofounder of the Schomburg Center's Annual Black Comic Book Festival. He received his BFA from the School of Visual Arts and now lives in Connecticut. Visit him online at www.jerrycraft.net. Jerry Craft is an author and illustrator who has worked on numerous picture books, graphic novels, and middle grade novels, including The Zero Degree Zombie Zone by Patrik Henry Bass. Jerry is the creator of Mama's Boyz, an award-winning syndicated comic strip. He has won five African American Literary Awards, and he is a cofounder of the Schomburg Center's Annual Black Comic Book Festival. He received his BFA from the School of Visual Arts and now lives in Connecticut. Visit him online at www.jerrycraft.net.